Since it’s raining this week, my husband requested me to cook him Tinolang Manok.. Masarap nga naman humingop ng mainit na sabaw pag naulan.. 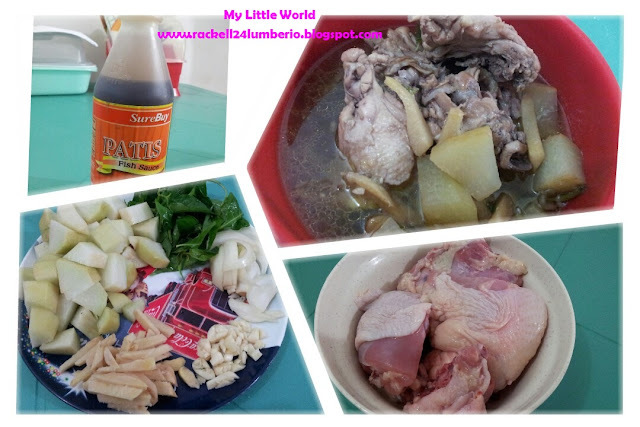 So last Saturday, I cooked for Tinolang Manok ala Rackell for the first time, in fairness nagustuhan naman nya.. Haha. Heat oil on a saucepan over medium heat. When onion turns glowing, add the chicken pieces. Add water and fish sauce. Bring to boil. Lower down the heat and simmer for about 20 minutes or until chicken is half done. Add the green papayas. Simmer for about 15 minutes or until papayas are cooked. Last but not the least, serve it with rice.